In an important match for both sides in the Mid-Atlantic U16 Boys Division, PSC Coppa avenged an earlier 5-2 loss to Jersey Shore Boca by posting a 3-1 win. Counter-attacking opportunities where frequent and both sides missed some quality scoring chances that were erased by each side’s goalkeepers, PJ Tucker of Coppa and McMullen of Boca. The Boca U16s opened the second-half with an all-out assault on the Coppa goal that yielded a 50th minute penalty-kick that was converted by Joseph Sorrentino to make the match, 2-1 in Coppa’s favor. Through the conclusion of the match, it was a battle of goalkeepers as both made several outstanding saves. Coach Tom Gentz and the Boca U15s remained perfect this week as the bested the Philadelphia Soccer Club 3-0 in a mid-week contest at the Manchester Soccer Complex. 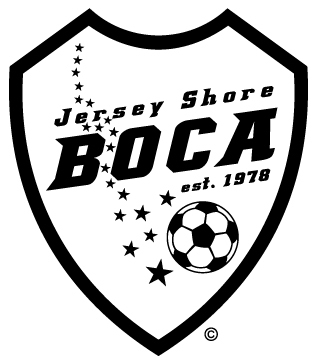 Boca improves to 5-0-0 and remains in sole possession of first place in the SYL’s U15 Mid-Atlantic Division. The Boca U14s took PSC Coppa at the Manchester Soccer Complex in a mid-week match. Despite dominating the game in possession and shots Boca lost 5-2. The Boca goals by Darren Erbe (Bay Head) in the first half and Shane Ferguson (Pt. Pleasant Beach) in the second half were the only shots finding the net although Boca out-shot the PSC 25 to 11. “This is a game where a lesson of speed must be learned by us. Despite being able to control the pace of the game overall, the speed of PSC created more problems for us then we could handle. We’ll go back to the training grounds and work on that and finishing before our next match” mentioned Boca U-14 Coach Bill Carroll.